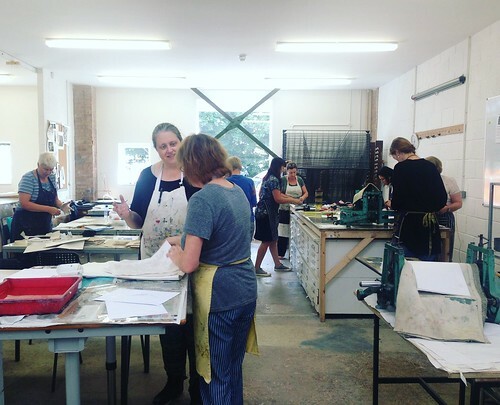 Print Club is an opportunity to gain confidence and build printmaking skills as part of a small group in a technician led series of six sessions for £72. It is designed as a perfect stepping stone from course participation to membership, allowing you time to build on skills gained from previous courses and hone your technique in a specially supported session. It is also a great way for members to return to the studio after a break. This Tuesday morning club focuses on one technique over six weeks. The first week comprises teaching and demonstrations, whilst subsequent weeks take the form of self-directed, guided sessions, encouraging participants to use the time to explore and experiment with the technique. Previous Print Clubs have focused on drypoint, linocut, collagraph, monoprint and letterpress. Have a look at our upcoming Print Clubs here. It was fantastic. I loved all six weeks and will do more! Really enjoyable – great for experimenting and I have learnt loads. Excellent facilities, friendly and supportive staff. Great to see artists working. Really keen to join as a member. The technicians are informed and very helpful. The facilities are great. The workshop has a lovely atmosphere. The Linocut Club had a great atmosphere – everyone very supportive of each other.